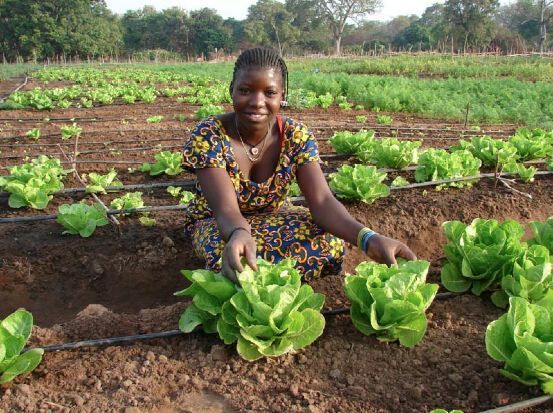 Development in Africa could falter as climate change grips the continent, increasing the length and severity of droughts and floods by altering precipitation patterns, among other impacts. The region needs a major shift in its economic development policies and thinking towards decentralised, green economic development, experts now say. “The world’s big economies are largely living off financial transactions which are unconnected to development,” warns Supachai Panitchpakdi, secretary-general of United Nations Conference on Trade and Development. “Export growth does not automatically result in green economic growth, we must look at trade for development,” said Panitchpakdi. In a rejection of failed neoliberal economic policies, Panitchpakdi said strong national policies on investments, taxation, protection of local industries, including subsidies, and changes to less restrictive intellectual property regimes are what is needed to green economies in Africa and elsewhere. “Green economic development underpins environmental protection, economic growth and development,” he said. The tentative global economic recovery this year is largely a jobless recovery because the current economic growth model is designed to make “people redundant”, said Achim Steiner, executive director of the U.N. Environment Programme (UNEP). “It favours large concentrated power grids, for example, which require very few people,” Steiner told IPS. “After 50 years of development, 80 percent of Kenya’s population had no access to electricity. Now, after a 2008 shift to renewable energy, more Kenyans have access to electricity than ever before,” he noted. 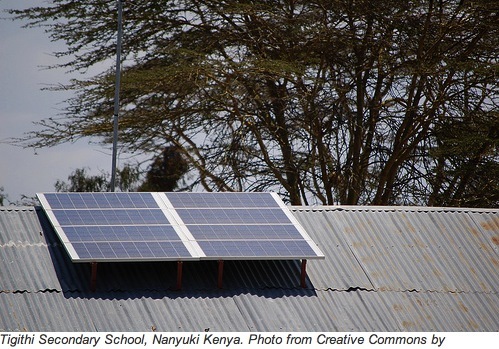 Kenya’s feed-in tariff, similar to Germany’s, is expected to produce about 1300 MW of electricity generation capacity from biomass, geothermal, biogas, solar energy, wind, and small hydro this year. A feed-in tariff offers long-term contracts at a set price based on the cost for renewable energy generation. Germany now employs more than 380,000 people in its renewable energy sector and 1.8 million in its environmental sector – far more than its vaunted automobile sector, Steiner said. “More than half a billion people in rural Africa have little or no access to electricity,” noted Nebojsa Nakicenovic of the International Institute for Applied Systems Analysis in Austria. Universal access to modern energy services globally has been estimated to cost between $80 and $100 billion a year in a number of recent studies, including those by the International Energy Agency and the United Nations Industrial Development Organisation in Vienna. “That seems like a lot of money but it is significantly less than the $300 to $600 billion being spent annually to subsidise the fossil fuel sector,” Nakicenovic pointed out. Technically, it is doable, representing roughly 20 gigawatts of energy generation – less than what countries like Brazil and South Africa have been able to add in recent years. Increasing energy access in Africa has a huge range of benefits, he says. It would drive economic development, improve the health of millions by reducing indoor air pollution from kerosene and biomass burning, reduce emissions of greenhouse gases like black carbon and reduce deforestation. Local technology and local energy distribution in the form of small-scale hydro, biomass, biogas, solar, wind and other forms of production are best suited to Africa. The challenge is mobilising the investments needed, he said. These should be national programmes with long-term financial commitments from the international community. 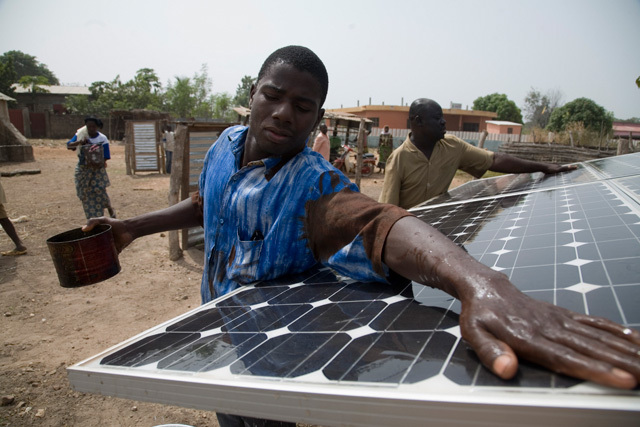 How do you get solar panel and wind turbine power to Africa’s electric grid infrastructure? If one were to place solar panels to cover Africa’s various deserts and Wind turbines on mountains, can this electric energy be sent to existing grids? What is the approximate cost of making the Continent of Africa grid appropriate to meet the electrical needs of a Billion people? If by chance you don’t have the answers to these questions, can you tell me how or where I can obtain this information.